Can you name the two pieces of equipment in this photo, and describe how they relate to one another? If you live in a warm climate and occupy a smaller amount of space, chances are you will have little trouble with both parts of this question. On the other hand, if you live in a colder climate, and have a larger, older, and traditionally-built home, there’s a good chance you may instead struggle with our question. 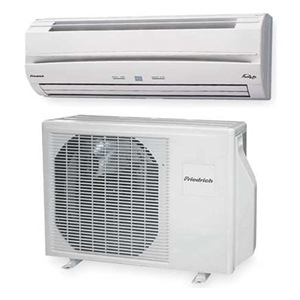 As you might have known already, the items in the photo to the left are the indoor and outdoor components of a small, two-part or “split” air conditioning system, commonly known as a mini-split. Mini-split systems are commonly-used in many parts of the world, but are almost unheard of in other places. But this heating and cooling divide is changing, as building quality and energy efficiency standards improve, making mini-splits a logical choice in all but the coldest of climates. The building block has been around for a while. It arrived sometime after the thatched lean-to and hut, and long ago offered us a new, economical, and more protective way of building, especially as our early towns and cities formed. Given ArchaNatura’s mission to promote progressive building and design, it might be a surprise that our first post would involve the seemingly lowly and decidedly retro building block. After all, as a building material, blocks may be low-cost, but they are heavy, a pain to transport, and offer poor thermal characteristics. 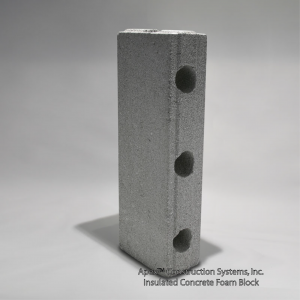 Blocks can shake apart in earthquakes and storms without added reinforcement. And in any case, they are labor intensive and fairly inflexible when complex building forms are desired. In a word, blocks have been done.